Universal Pictures unveiled the first trailer for next summer’s “Jurassic World” movie Tuesday starring Chris Pratt. From the looks of it, the fourth installment in the series will be filled with plenty of computer-generated (CG) dinosaurs and Velociraptors. 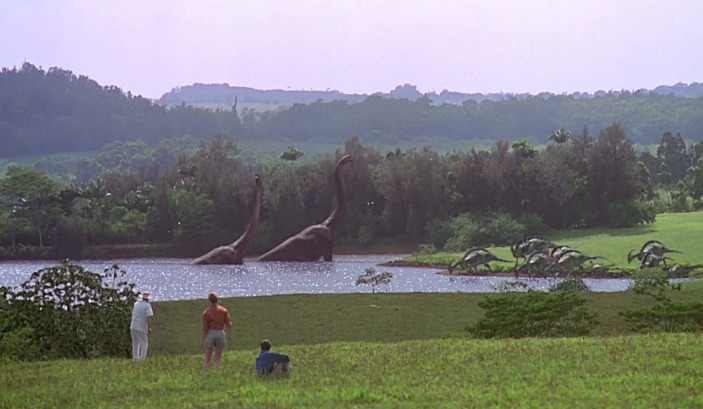 When the first “Jurassic Park” came out in 1993, it contained very little CG. Director Steven Spielberg originally wanted the dinosaurs in the film to be done through practical effects with stop motion. It wasn’t until producer Kathleen Kennedy spotted CG test footage of a T-Rex on a computer screen at visual effects studio Industrial Light & Magic (ILM), that it was decided to mix CG dinosaurs in with the live action film. 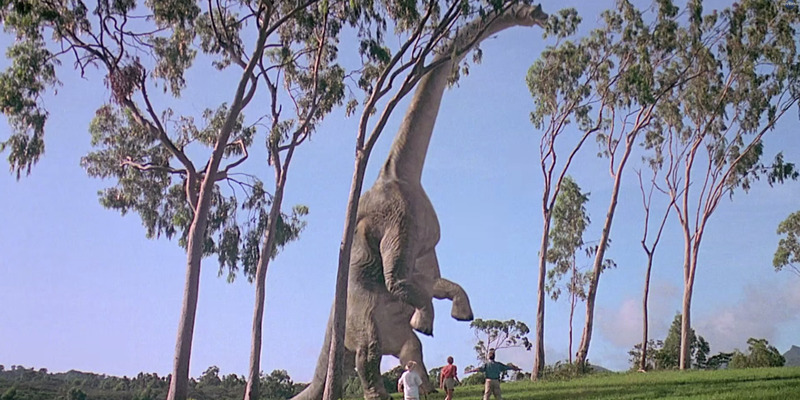 There are only 14 minutes of dinosaur visual effects in “Jurassic Park,” about four of which were made with a computer, but its lasting effect on movies has been monumental. Two years later, 1995’s “Toy Story” was the first full-length computer-animated movie. Today just about every film — from James Cameron’s “Avatar” to summer blockbusters like Michael Bay’s “Transformers” series — owes credit to CG. Business Insider spoke with Steve “Spaz” Williams, who was a CG Animator at ILM, the visual-effects studio that helped bring “Jurassic Park” to life. Williams broke down the steps it took to bring the dinosaurs from paper and pad to the big screen in CG. 1. They begin with drawn designs and prosthetics of the different dinosaurs. 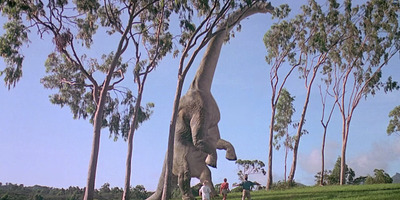 The production used CG for velociraptors, brachiosauruses, and the tyrannosaurus rex, which Williams worked on primarily. Courtesy of Steve Williams.A T. rex drawing by Williams used to figure out where joints on the dinosaur would go. 2. Next, those renderings needed to make their way into the computer. 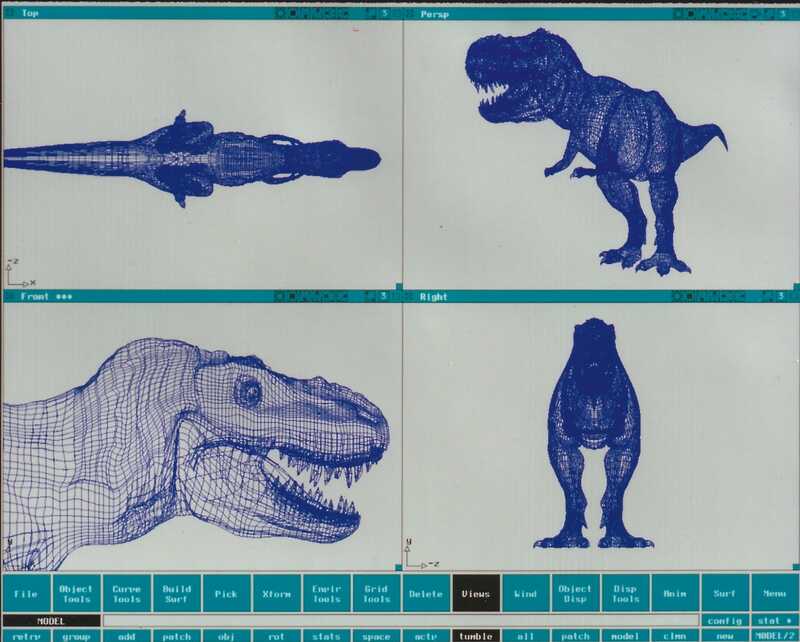 They scanned models, including ones for the T-rex and the velociraptors, into the computers. The Academy screengrabAccording to FXGuide, Williams took a model of a 5-foot T. rex made by Stan Winston to scan. “In order to get it into the computer we actually fire a laser at the three-dimensional rubber prosthetic model and extract the data so the computer had it essentially,” says Williams. Williams explains it’s like the opposite of 3-D printing with them taking an object and turning it into data. 3. They then reconstruct the data to make it work in the computer. 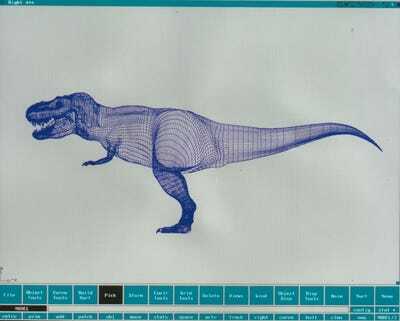 These are two images of T. rex data from Williams’ monitor using software called Alias. 4. 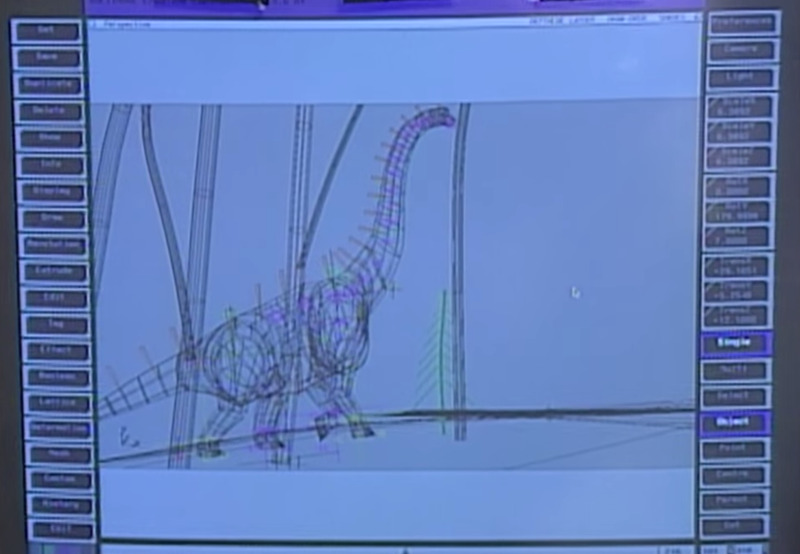 An animation piece of software called SoftImage 3D is used to figure out the joint placement on the dinosaurs. 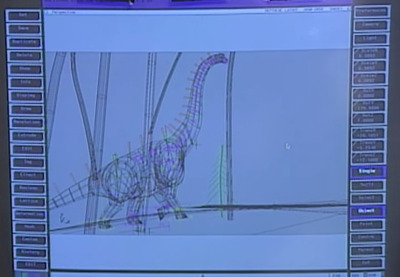 Here, you can see one of the Brachiosauruses in the beginning of the film. 5. After that, the data has to be “rigged” with a digital armature in wireframes. This is the framework for the dinosaur that helps provide its structure allowing it to stand up, move, and run. 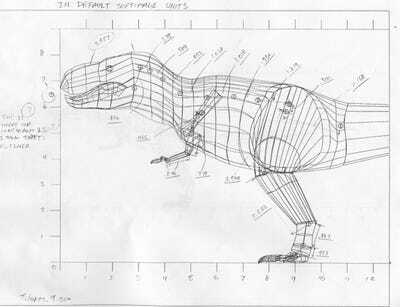 Below is another wireframe for one of the raptors in a kitchen scene where the two children are trying to outsmart the dinosaurs. 6. Next, the dinosaurs get their skin. “We used a program called Viewpaint, which allowed us to actually paint the texture of the skin in the computer so now we have this textured map,” says Williams. 7. To put all of the separate images together, they needed to be rendered by massive graphics computers. 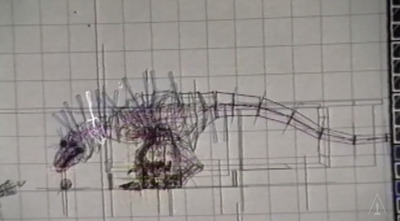 Williams built and animated the image below of the first fully rendered T-rex test. It was this video that convinced the producer Kathleen Kennedy and Steven Spielberg that “Jurassic Park” should be made in CG rather than stop motion. Williams also animated all of the shots in a famous T-rex Jeep-chase sequence.He says each frame in the entire sequence took an estimated 12 hours to render. The point where the T-rex breaks through the log is 75 frames long. “I animated all those shots where the T-rex is chasing the jeep. It took me four months to animate it, just to get the running to work properly,” says Williams. 8. From there, the dinosaur needs to be put into a scene through a process called compositing. This is where all the pieces to the puzzle are assembled together. CG shots are combined together with live-action shots and any background and foreground imagery referred to as plate photography. In this case, live-action shots of actors were combined with photography shoots in Kauai and ILM’s work on the brachiosauruses and birds. 9. Once it’s put together, the images are reviewed to make sure they work. When everything looks good, the scene is put to film. Final images are reviewed on a high-concentrated projector before translated to film. All together, Williams says it took about a year to bring the dinosaurs to life. “Basically May of ’92 to May of ’93 was the entire build and composite time for probably 40 shots,” says Williams. After $US1 billion at the box office, you can’t argue with the result.